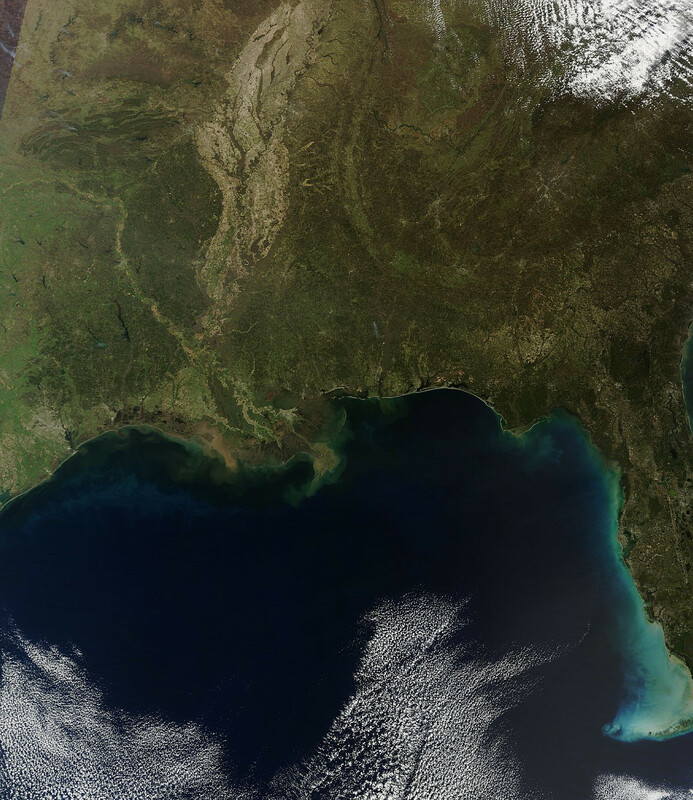 In March we shared a particularly striking view of the Gulf Coast – some images illustrate problems, others are simply beautiful. Click here for the full image from NASA. In the past year we made significant strides toward realizing this vision, and while we have already shared our Top 10 Most Viewed Articles, we thought it would be good to share what we think were our most significant accomplishments in 2012. We have continued to document the ongoing spill at Taylor Energy Platform 23051, damaged by Hurricane Ivan in 2004. Still, the oil keeps coming with no sign of activity to finally plug this continuous leak. We set up a website to document the unrelenting chronology of spill reports. 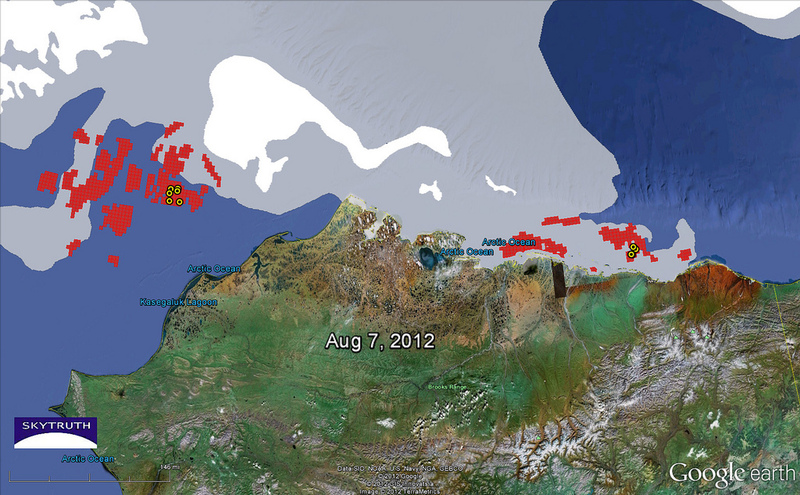 We closely followed Shell’s attempts to drill in the Arctic Ocean during the brief summer season. 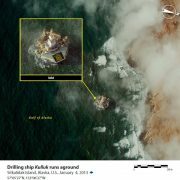 Ultimately, a series of embarrassing failures (including both of their drill rigs running aground, a flattened spill containment device, criminal investigations on the drillship Noble Discover, and the drill rig Kulluk holed up in a remote harbor south of Kodiak Island awaiting salvage assessment and repair) reinforced concerns that we’re not ready to drill offshore safely in this difficult region. On the left, sea ice retreating in early August, but still rather close to Shell’s Arctic drilling operations this summer in the Chukchi Sea. Possible Contamination from Stolthaven Chemical Facility, Braithwaite, LA The Gulf Coast is home to a significant amount of chemical plants, fed in part by petroleum resources pumped out of the Gulf. In the aftermath of Hurricane Isaac, members of the Gulf Monitoring Consortium flew over the Gulf and onshore infrastructure, documenting a number of slicks from storm-damaged facilities, as well as highly visible damage at Stolthaven that forced the evacuation of nearby residents. Few human activities alter the natural terrain more thoroughly and permanently than mining, and modern remote sensing allows us to visualize that and measure it very precisely. 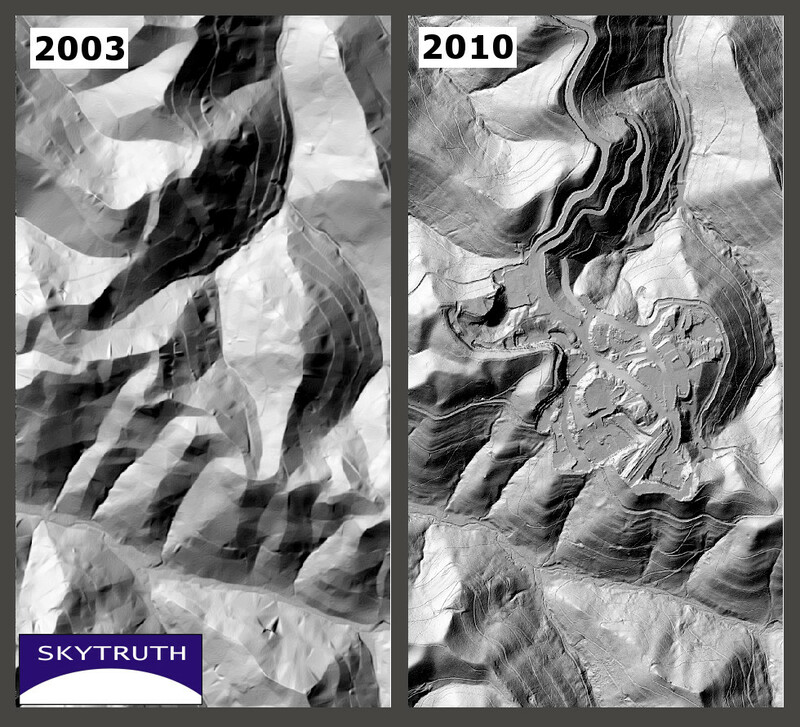 Using Digital Elevation Models (DEMs) created from aerial survey imagery taken in 2003, and from a Light Detection And Ranging (LiDAR) laser survey flown in 2012, we created detailed representations of the terrain before and after mountaintop removal mining at the Spruce #1 Mine in Logan County, West Virginia. Another area that we turned our attention to is the practice of coal export, predominately to Asian markets due to the growing demand for energy there, and cheaper natural gas prices here. If new coal-export terminals are approved in the Pacific Northwest and on the Gulf coast, coal mining here in the US could accelerate. In this article, we mapped the area that has already been impacted by mining on public lands in the Powder River Basin of Wyoming, compared it to a more familiar area — San Francisco — and showed the area under permit that could be mined in the future. 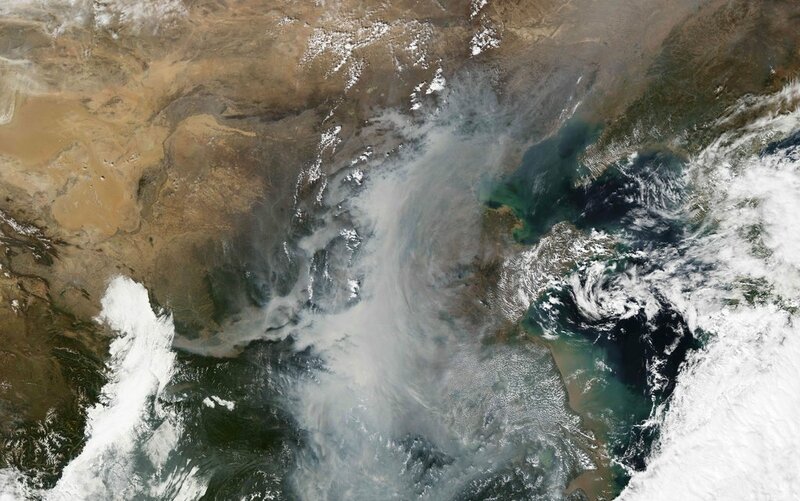 Smog (grey clouds) over China as seen by NASA’s Moderate Resolution Imaging Spectroradiometer (MODIS) in October 2010. Increased exports through the Pacific Northwest are expected to find a major market in China and Southeast Asia. 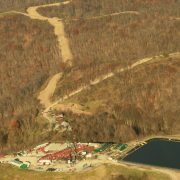 As part of our work on shale gas development in North America, we coordinated two LightHawk flights over active shale gas drilling areas in the Marcellus Shale, documenting the impact shale gas development has on the landscape while showing stakeholders and partners the value of an aerial perspective on these complex issues. Check out the video and our photo galleries. 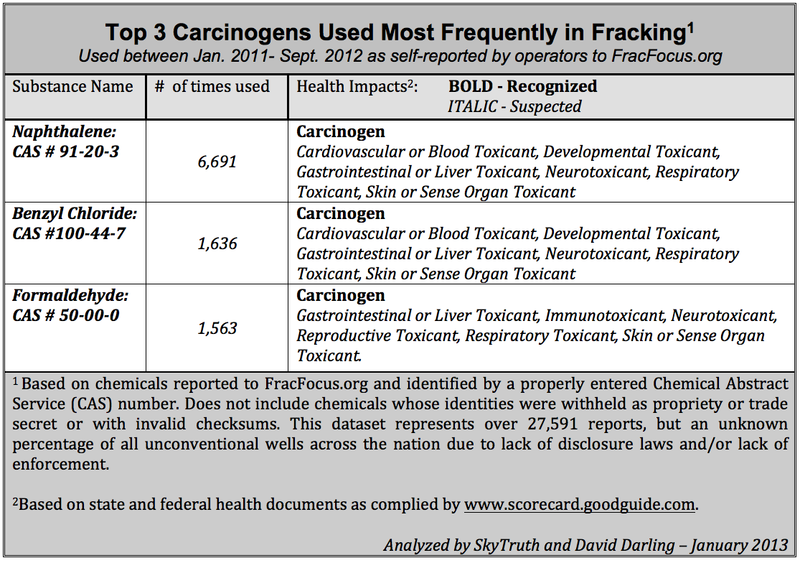 Worthy of an entire chapter of SkyTruth history, the FracFocus data release was the culmination of a major effort on our behalf and a significant contribution to the conversation on fracking. 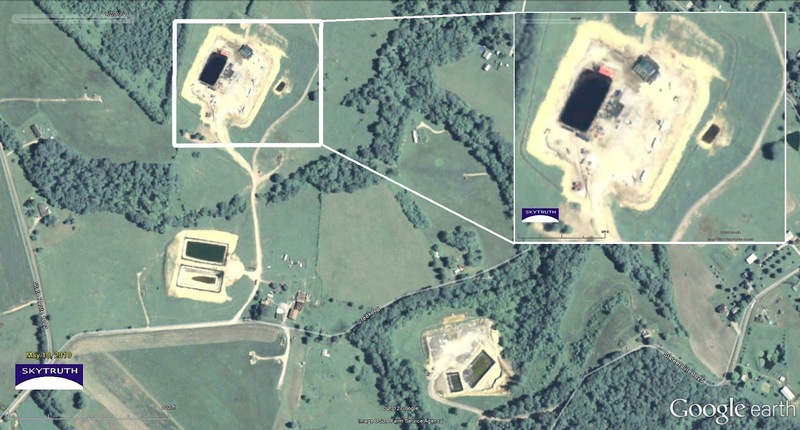 With it, researchers and decision makers can finally see the whole picture of reported fracking activity, at least as it is disclosed to the public. There are several critical shortcomings with the current state of “disclosure” (we made specific technical recommendations to the federal government to address some of those flaws), but using the aggregate database we released, anyone can quantify some of those problems and bring them to the attention of the public, regulators, policymakers and industry. SkyTruth Alerts: Drills, Spills, and Fracks, Oh My! 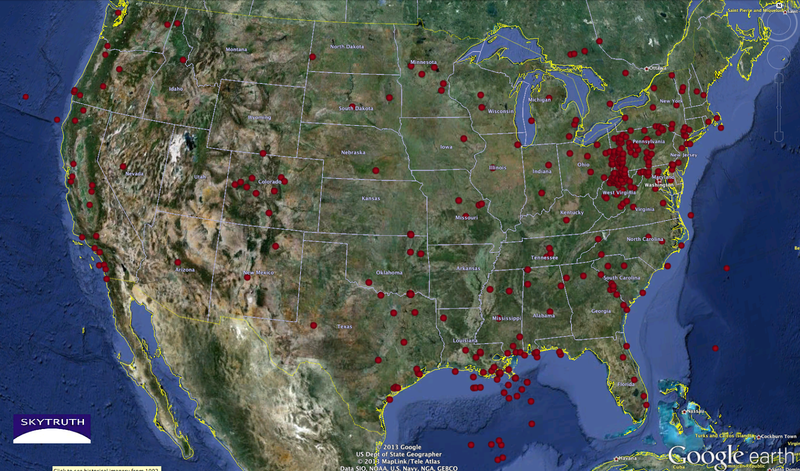 Here, we plotted the centerpoints of all active Alerts subscriptions in the Lower 48 states and coastal waters. Most subscribers are apaprently interested in the Marcellus Shale play in the mid-Atlantic, and pollution monitoring in the Gulf of Mexico. SkyTruth Alerts are viewed and/or shared approximately 10,000 times each month. We built this system as an internal tool to help us know when and where to look for spills, but we also realized this system had the potential to be a great resource for the public to stay informed about incidents in almost real-time. In 2012 we significantly improved the Alerts system, adding reports from industry about the chemicals used in hydraulic fracturing operations nationwide, and drilling-related safety and environmental violations issued by regulators in West Virginia and Pennsylvania. In April we noticed a 92 mile-long oil slick off the coast of Africa, but on this radar satellite image the likely culprit was revealed as just a bright, white spot headed west at the far end of the slick. Using other data collected by satellites, one of our enterprising Shepherd University interns was able to conclusively identify the mystery ship responsible for this mess. We were told, by folks who should know, that this was the first publicly documented case of detecting a pollution event on the open ocean and identifying the responsible party, using only space-based data. 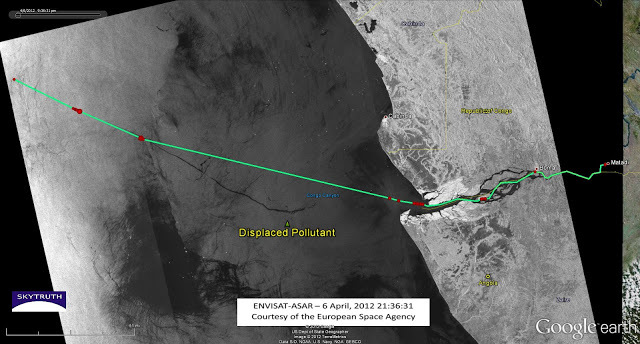 Micro-satellites tuned to listen in on the location data broadcast by ships (required by many insurance companies to help prevent collisions) recorded the path of the offending vessel. Read more on the blog. In another first, we are now using the same approach to detect and assess illegal fishing activity in the South Pacific Ocean. This project is will continue throughout 2013, so stay tuned and check back here for updates on our progress! Moderate Earthquake in Colorado Yesterday – Related to Fracking? The largest historical earthquakes were a M4.4 in 2000 near the Paradox Valley in western Colorado and a M4.3 in 1953 near Green River, Utah. The M4.4 earthquake in 2000 and many smaller earthquakes in the Paradox Valley were induced by brine injection in deep wells. “Brine” is drilling-industry lingo for the non-hydrocarbon fluids that are produced by oil and gas wells. This is mostly water by volume, but often includes toxins — metals and salts leached from deep bedrock, residual chemicals used in drilling and fracking the well, and low levels of radioactivity. 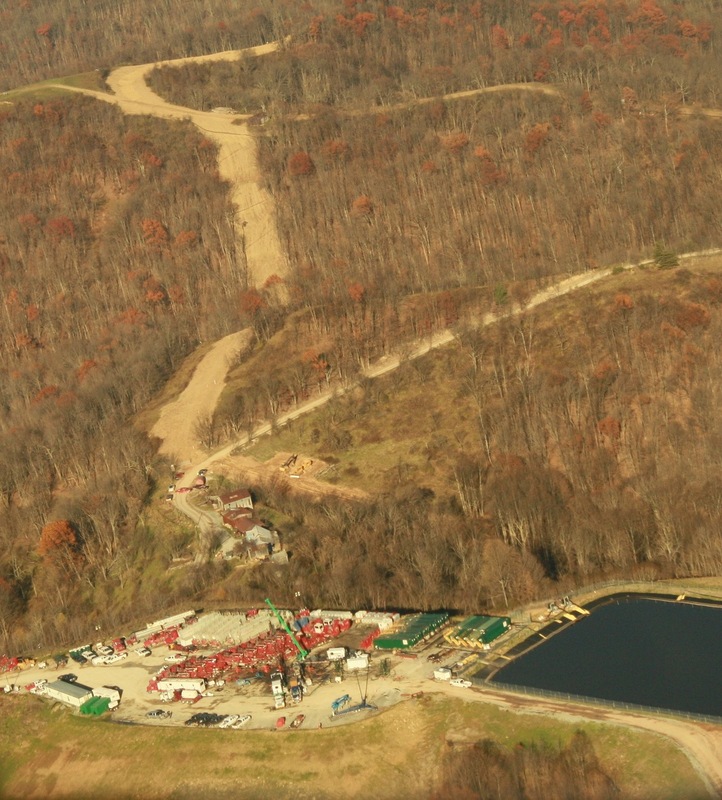 Getting rid of this stuff by pumping it back into the bedrock is an increasingly common practice as the current national shale-gas and shale-oil drilling booms are producing large amounts of wastewater that in some places threaten to overwhelm the current disposal infrastructure. This method of disposal has been proven for decades to cause small to moderate earthquakes, and is strongly implicated in recent earthquake swarms in Ohio, Oklahoma, Colorado and Arkansas. We suspect this shallow quake (1.2 km depth) is possibly the latest example of an earthquake related to oil and gas activity. So far the only known example of earthquakes caused by the hydraulic fracturing operation itself, is from Lancashire, England in 2011. Given the number of disposal wells and fracking operations, induced seismicity due to oil and gas development remains a relatively rare occurrence, but as one scientist puts it “an earthquake even of magnitude 4 in a populated area can be an unpleasant thing.” Indeed. /wp-content/uploads/2016/08/test_logo.png 0 0 John Amos /wp-content/uploads/2016/08/test_logo.png John Amos2013-01-24 19:58:002016-08-24 19:59:33Moderate Earthquake in Colorado Yesterday - Related to Fracking? Coal Exports: Are You Safe? Think you’re safe from the effects of coal exports because you don’t live near a coal mine? How about railroad tracks? Chances are you either live near railroad tracks or travel next to or across railroad tracks to get from point A to point B in your daily travels. According to this article from the Monroe Monitor and Valley News in Monroe, WA, there were 18 coal train derailments last year in the United States, with 2 resulting in the deaths of 4 people. A couple was killed when a coal train derailed in a Chicago suburb last July, and in August, 2 college girls were killed when another coal train derailed in Ellicot City, MD. Neither one of those cities is near a coal mine, yet both dealt with the destruction and sadly, the deaths, caused by these train derailments. And what caused those trains to derail, anyway? Debris on the tracks? Human error? Weather? Another side effect of coal exporting is the hazardous coal dust left behind either when the coal is sitting waiting for shipment or when the coal is actually ON the trains being shipped to the coast for exportation overseas. Still not convinced? Think about this. In a town the size of Los Angeles or Houston, there might not be too much of an effect on traffic if a 137-car coal train came through town. Those cities are big enough to handle traffic. There are hospitals located all over those cities. But what about a city the size of Billings, Montana? You can see from this blog by our Shepherd University intern Yolandita that there would be a serious impact on the region if the town were to be separated — possibly many times each day — by coal trains of this size. A fire or motor vehicle accident on one side of the tracks, fire trucks, EMS or hospital on the other side of the tracks, and a coal train blocking all of the railroad crossings, literally cutting the town in half, would cause a major delay. And in emergencies, seconds count. 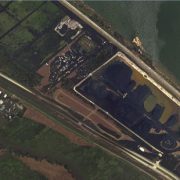 NOAA aerial photography taken September 3, 2012, showing flooded Kinder-Morgan coal export facility and residential neighborhood near Braithwaite, Louisiana in the wake of Hurricane Isaac. So if you think just because you live hundreds of miles from a coal mine, you won’t ever be affected by coal exportation, think again. https://skytruth.org/wp-content/uploads/2013/01/SkyTruth-KinderMorgan-coal-terminal-postIsaac-NOAA.jpg 310 640 Teri Biebel /wp-content/uploads/2016/08/test_logo.png Teri Biebel2013-01-11 21:40:002019-02-15 11:55:54Coal Exports: Are You Safe?